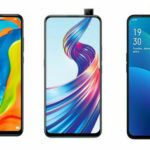 We recently reported about OPPO’s upcoming smartphone, the F11 Pro. The phone carrying model number CPH1969 has received certification by NBTC certification agency in Thailand along with Indonesia’s TKDN agency. 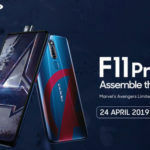 Now, in the latest report by 91Mobiles, the first press renders of the OPPO F11 Pro have been revealed alongside the specifications. The phone is dubbed to launch in India soon. 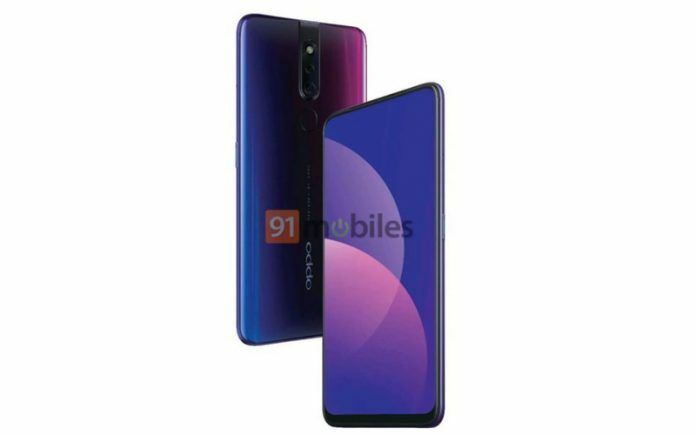 The leaked press render reveals the design of the OPPO F11 Pro. The phone has slight bezels on the sides and chin at the bottom. The OEM has integrated the earpiece in the top bezel of the phone. The back panel boasts gradient design with a dual rear camera setup paired with an LED flash. Interestingly, in the rear camera setup, the LED flash has been placed on the top. There is a dedicated strip on the rear panel that houses the camera setup. The back panel of the F11 Pro also features a fingerprint sensor, which is oval. Although the press render shows just one gradient hue model, we can expect OPPO to add more variants. 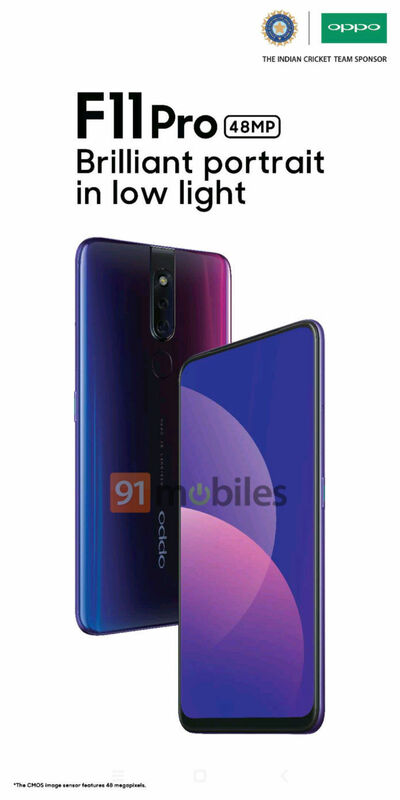 Concerning specifications, the OPPO F11 Pro is expected to come with a 48MP primary CMOS image sensor in the dual camera setup. 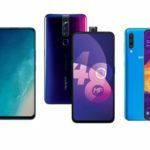 Reportedly, the OPPO F11 Pro will come with the same camera functionality as the Redmi Note 7 Pro, i.e. ability to take photos in 12MP resolution and use pixel binning technology to capture images in 48MP. Looking at the press render of the F11 Pro, we couldn’t help but compare its design with the upcoming Vivo V15 Pro smartphone. Both the phones look quite similar, and even the V15 Pro will have the same camera functionality. The main highlight or similarity between the two is going to be the pop-up selfie camera mechanism. 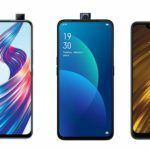 The V15 Pro is confirmed to feature a 32MP pop-up selfie camera while the F11 Pro is rumored to come with the same setup. Under the hood, the OPPO F11 Pro is tipped to come powered by a MediaTek Helio P70 processor clubbed with 6GB of RAM and 128GB of internal storage. 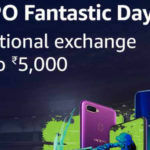 As for OPPO F11 Pro’s expected price in India, the phone could debut under the 25K price segment. OPPO could launch it in the first week of March 2019. Compared to the Vivo V15 Pro, the OPPO F11 Pro seems to be lagging in terms of the camera specs. The V15 Pro features a triple rear camera setup while the F11 Pro settles for dual camera setup. 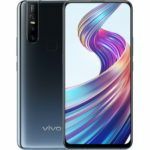 The V15 Pro is expected to launch under the 30K price segment, which could give an edge to the F11 Pro that is supposed to launch at a lesser price. It would be interesting to see how the F11 Pro turns out to be when it goes official next month. Stay tuned with us to get updates about it. In the meantime, you can share your thoughts on the leaked press render of the F11 Pro in the comments below. Another Helio P70 device? Finally!! !